Harrie Kraaijeveld reports on the 2018 edition of the triennial air show held in August on the island of Texel, the Netherlands. In the Netherlands and abroad, the island of Texel is best known as a holiday and leisure destination, but once every three years the isle also manifests itself with the Texel Airshow. The airshow of Texel is a unique event for Dutch standards. It has been organized since 1980 at Texel International Airport, a grass strip airfield mostly used by skydiving and recreational flights. The twelfth edition of the airshow took place on August 4, 2018. The event offers a great diversity of both historical and current day, both military and civilian, airplanes and helicopters. In the early afternoon the airshow was opened by the Para Display Team of Paracentrum Texel followed by an “aerobatic cloud experience” by the main sponsor Leaseweb’s EA-330LT. 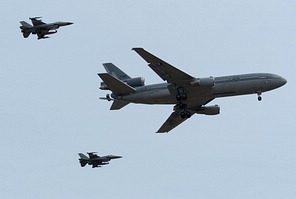 Military participation in the flying program consisted of a CSAR demonstration by a Mi-35 ‘Hind’ and a Mi-171Sh ‘Hip’ of the Czech Air Force, a German Luftwaffe A400M fly-past, and a fly-by formation consisting of a Royal Netherlands Air Force KDC-10 with two Belgian Air Force F-16AMs. Belgian F-16s are currently on Quick Reaction Alert (QRA) duty for the cooperative air policing of the Benelux. This fly-by emphasized the close ties between the two air forces even more. The Czech Mi-35 ‘Hind’ flew again later in the program to perform its solo display. The flying program also provided display slots for various historical aircraft. Among these participants were the Flying Bulls from Austria with their F4U Corsair and T-28 Trojan, the Bronco Demo Team from Belgium with their OV-10B, the Stichting Koninklijke Luchtmacht Historische Vlucht (“RNLAF Historical Flight Foundation”) with their Beechcraft D18S and AT-16ND Harvards, Stichting Vroege Vogels (“Early Birds Foundation”) P-51D Mustang “Trusty Rusty”, and a AT-6A Texan in Royal Netherlands Navy colour scheme. The Dutch Hawker Hunter Foundation also attended flying a short pass with the Hunter, which had just returned to the Netherlands after maintenance in the United Kingdom. 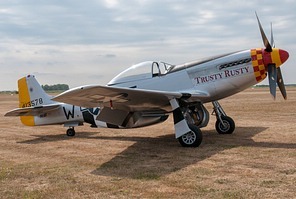 The Breitling Jet Team, Dutch Thunder Yaks, Frank “Woody” van Houten, Brendan O’Brien’s Flying Circus and the Royal Jordanian Falcons completed the flying display with their aerobatic shows. Taking part in the Texel Airshow for the fifth time, the Royal Jordanian Falcons were the closing act of the flying program, however because of the low cloud base at the end of the afternoon they had to cancel their show for safety reasons. Besides the participants of the flying program that could also be admired on the ground, was the static show supplemented with a RNLAF Chinook, Apache and PC-7. The PC-7 featured tail art for the 30-year anniversary of 131 (EMVO) Squadron. Besides the Dutch Dorniet 228 of the Coastguard, the German Navy was also present a Do 228 that is used for Pollution Control operations. 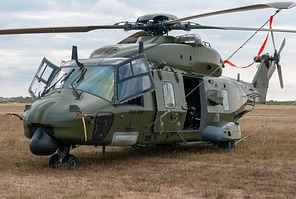 The Belgian Air Force had replaced the cancelled Sea King demo with a NH90 TTH for the static show. 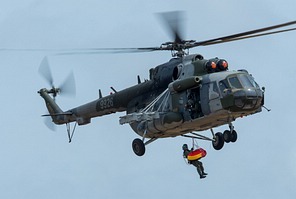 The Polish Army was present with a Mi-17AE, which is specially configured for medical evacuation flights. The show also had to cope with a few cancellations. 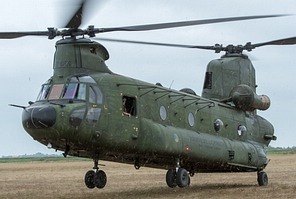 As stated, the Belgian Air Force was unable to fly the Sea King and the Royal Netherlands Air Force pulled the promised C-130 from the flying display. Also, the Spitfire, P-38 Lightning, and finally the O-2A Skymaster of the Postbellum foundation could not attend. At the last moment, the Postbellum O-2 was replaced with a civilian variant, namely the Cessna 337 Skymaster of aerial photography company Flying Focus. However, the biggest disappointment of the show was still the absence of the Dutch PBY-5A Catalina, because this would have been its last public appearance in the Netherlands in light of the decision to sell this legacy aircraft. Unfortunately, problems with one of the engines had definitively grounded the Catalina a few days before the airshow. Later this year, the aircraft will go to a new owner abroad. Run and prepared by volunteers, the corporate-sponsored Texel Airshow is the biggest air show of its kind in the Netherlands. The next Texel Airshow is planned to be organized in 2021.